It finally happened. I went to Arizona to see The Maine! My 16 year old self would be jumping up and down or in pure disbelief. When I was young (and naive), I wanted to go to ASU and live in Phoenix so I can stay current in The Maine news and events. Obviously that didn’t happen (Sorry 16 year old Brittney), but visiting Arizona was just as satisfying as living there! Brad and I had so much fun! Our first day in Arizona, we decided to drive up to Sedona to do some hiking. We got really lucky with our rental car! We were upgraded from a sedan to an SUV for free! Red Rocks in Sedona, Arizona. Everything is so beautiful in Sedona! From the shops to the rocks, we were in awe! We don’t have hills and mountains like that in Ohio, so it was really a site to see. We also took some time to walk around the small shops of Sedona. The landscape and art surrounding the whole shopping area makes it feel lively! It really was absolutely beautiful. The next day, we decided to drive to the Grand Canyon. We weren’t prepared for how much snow this part of Arizona could get! There was a lot. I believe it was about 12 inches. Unfortunately, the snow left it too difficult to see much of any of the canyon. We drove around and got a couple glimpses. But, for the most part, it was a white abyss. But, we still walked around the museum and hotel shops throughout the park. Got some souvenirs, had a great breakfast, and then got as far away from the snow as we could! We did come all the way from Cleveland to get away from snow. After exploring the great wonders of Arizona, we headed back to Phoenix where all The Maine festivities started to begin! The first day was the 8123 pop-up shop where they had all kinds of cool merch for sale. I bought a lot of stuff. Like a whole lot. 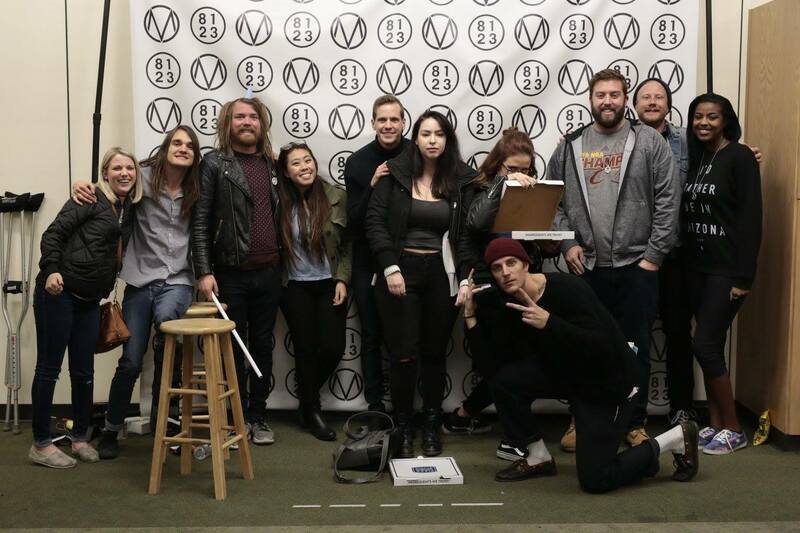 Like usual, many members of The Maine were present at the store and assisting with making everything possible. Especially Pat who was on crutches! So, it’s a nice casual experience with the band. The following day, Brad and I wanted to take some time to discover downtown Phoenix. We visited the Arizona Science Center, walked around the ASU campus, and tried our best to eat locally! We did a lot of walking, but we saw a lot! Saturday was the day we had been waiting for, #8123Fest! The excitement of the day finally being here was almost too much to contain. We got there early enough to hear sound check outside the venue. So yes, we were waiting in line for a while. Once inside the fest, we saw everything take shape. There was a merch tent, stations to get drinks, food trucks, the van to sign (if you’re a long time fan of The Maine, you know how awesome this is), and a stage ready for several amazing performances. There was also a stage and bar on the inside of the Crescent Ballroom. The first performance on the main stage was John the Ghost. Led by lead vocalist of The Maine, John O’Callaghan, the band performed some familiar tunes including Sour Grapes. It was a great start to the fest and got everyone excited! Throughout the day, you had the option to go to either stage to watch a performance. We did a little back and forth because I wanted to see Gorgeous war (at the crescent stage), A Rocket to the Moon (on the main stage), This Century (back at the crescent stage), and of course, The Maine who played on the main stage. I’ll break my recap down into stages. Gorgeous War is fronted by Joel Kanitz (formally the lead vocalist for This Century). I hadn’t had a chance to listen to the music beforehand, so this was my first impression. I was impressed by what I heard. The music was not as upbeat as This Century was. But, there was a lot of emotion felt in the slower songs. I was especially excited for This Century because I loved their music. I was so sad when they officially broke up. They played a few of my favorites like “To Love and Back” and “Everywhere Everything.” It was great to see them perform again, but I was a little disappointed that it wasn’t the full band. But, it was nice to hear those songs live again! The reunion of A Rocket to the Moon was definitely a highlight of the weekend. I wasn’t the biggest fan of them, but they had a few songs that I loved like “On Your Side” and “Dakota” which they played. Brad isn’t one to jump around with excitement for bands, but I did find someone who was just as excited and screamed along with me! It was such a fun time. Words cannot express how excited I was when The Maine came on stage. Like jumping a foot off the ground excited, like screaming at the top of my lungs excited, like “I can’t believe I am here witnessing this” excited. Do you get the picture? Their setlist was amazing. They played songs I hadn’t heard live, songs I loved years ago, and a new song for the first time! It really was awesome to be there and see them in person in Arizona. The day after the fest, Brad and I spent a little more time exploring Phoenix including meeting a friend for the first time. I’ve known her for years through the internet, but never actually seen each other in person. We bonded over our love (slight obsession) with The Maine long long ago. It was great to finally connect after so many years! After meeting my friend, we scooted into the very end of the meet and greet line for The Maine (we just couldn’t wait in another line). The meet and greet was in the pop-up shop, so I obviously bought something else while I was there. One thing that I have always loved about The Maine is that they take the time out to meet with their fans. They were talking and taking pictures for almost 5 hours! I don’t know any other band who does this. Even after they are told to end, they still continue anyway. I love how dedicated they are to their fans. Our trip to Arizona is one that I will never forget. I want to thank 8123, The Maine, and everyone involved in making that event possible. I also want to thank Brad for jetsetting across the country for his music obsessed girlfriend. I’m really lucky to have someone who not only travels with me but loves the music too! Arizona, thank you for being beautiful, I will definitely be back in the near future!